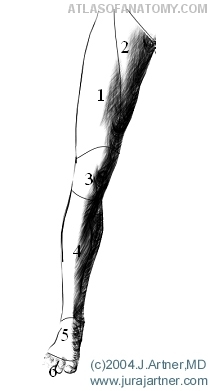 The regions of the leg (Regiones membri inferioris) begin below Regio inguinalis on the front and below Regio lumbaris on the backside. The front side of the Femur (thigh) is called Regio femoralis anterior, the back side is covered by Regio glutaealis above the Musculus glutaeus maximus (origin at Os ilium, Os sacrum and Os coccygis= the coccyx; insertion at Femur and Tractus iliotibialis) and Regio femoralis posterior, divided by Sulcus glutaealis (bottom furrow). Regio femoralis anterior contains a region inside, called Trigonum femorale, marked by Musculus sartorius (origin at the frontal upper spine of the pelvic bone= Spina iliaca anterior superior; insertion at upper Tibia) and Musculus adductor longus (origin at the pubic bone= Os pubis; insertion at the back shaft of Femur bone= Linea aspera) at the sides and Regio inguinalis at the top. The area around the knee joint is called Regio genus (anterior and posterior). The lower leg (Crus) begins under this area, consisting of Regio cruralis anterior and posterior (the calf area is also called Sura or Regio suralis). The area of the heel is called Regio calcanea (Calx). The foot (Pes) can be divided into an upper area (Dorsum pedis), directed against the body, and a bottom area= the sole (Planta pedis), directed against the ground. Similar to the hands, the foot can be further divided into a Tarsus, Metatarsus and Digiti (Toes; I= Hallux, II= Digitus secundus, III= Digitus tertius, IV= Digitus quartus, V= Digitus minimus).